Since the dawn of humanity, animals have played a leading role in human creative expression. Whether it is the significance of the depiction of a herd of bison in prehistoric Cave Art, or an Australian sulphur crested cockatoo conspicuously turning up in a late-fifteenth century altarpiece by the Italian painter Andrea Mantegna (! ); animals have allowed craftsmen to depict human empathy for non-human life, whilst being pivotal agents for conveying metaphors of universal meaning within our world. Learn how to draw a variety of animals, from man’s best friend to any animal of your choosing. An Equestrian horse by Leonardo da Vinci - Looking at the basic masses of the horse and how Leonardo employed contour to convey the musculature of the animal. The equestrian drawing will serve as a context for a basic comparative analysis in class between human artistic anatomy and that of the horse. An introduction to drawing hair, fur, feathers and scales – One major challenge in drawing animals is the depiction of fur; how to convey form and volume, while at the same time suggesting texture. These challenges are interchangeable with the depiction of human hair. This class will focus on drawing human hair over a basic egg-shaped conceptual mannequin of the human head and the ovoid form of the skull. A greyhound by Albrecht Durer - We will look at Durer’s very clearly rendered depiction of a greyhound’s overall form and fur. 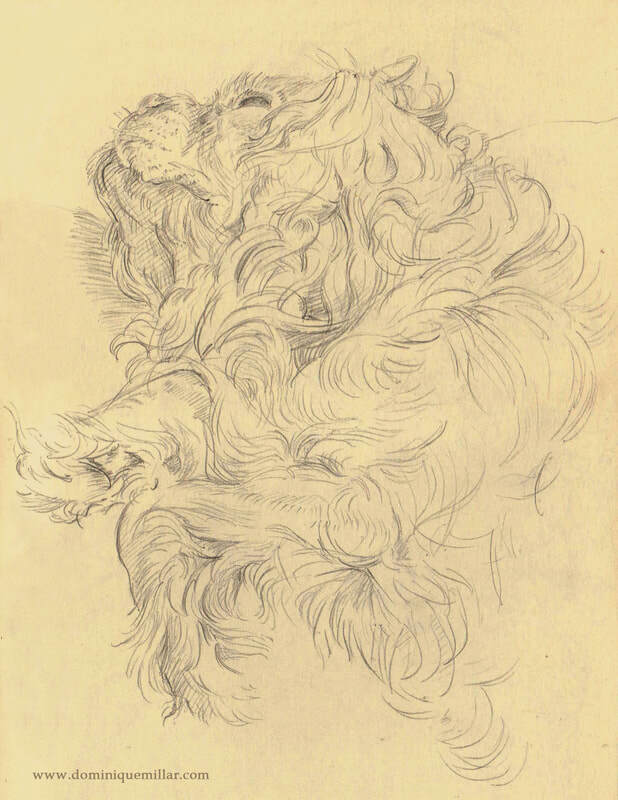 Students may bring in images of either their own dog, or a photo of a dog, to transpose the techniques of rendering form and texture from Durer’s greyhound onto a rendition of the animal. A playful cat by Thomas Gainsborough – We will observe Gainsborough’s use of black and white chalk on yellow-brown buff paper. Students may bring in images of either their own cat, or a photo of a cat, to transpose the technique of using a mid tone paper to suggest the mid-values of the animal and oil based chalk pencils to convey a sense of its form and the texture of its fur. OR draw an animal of your choice with assistance from your instructor. Acquire a basic inter-related knowledge of the artistic anatomy of humans to other animals. Conceive and articulate the overall masses of any animal. Depict the texture of hair, fur, scales and feathers while addressing the animal’s form and volume. Synthesize empirical observation with artistic invention by transposing techniques from Old Master drawings onto photographic images of animals. Oil based hard sanguine red, black and white chalk pencils.